If you’ve already visited the home page, you will have a little idea about me already. On this page, I want to share some photos with you from my life. When we meet for a demo class, I’ll be happy to tell a lot more about me and answer any of your questions. Enjoy the snaps! I live in the city of Cardiff which is the capital of Wales in the UK. I have lived here for 15 years and I think it’s a great place to live. 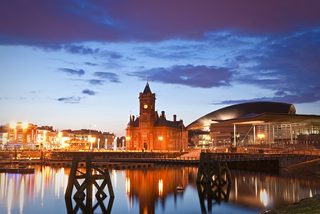 If you are ever coming to Cardiff, I can give you plenty of tips about what to see here! I love to travel and experience other countries and cultures. In 2008, I went on one of my favourite trips around Europe. 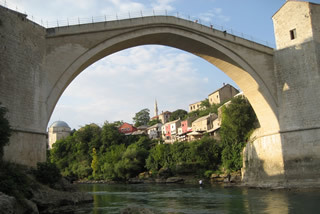 This picture is of the rebuilt bridge at Mostar in Bosnia. Last year I had the chance to visit Brazil. Music is very important to me. 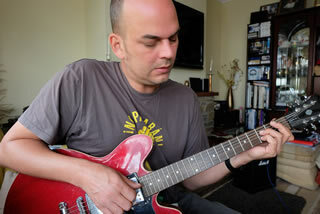 I have a real passion for the guitar and for music from different parts of the world. I love talking about music so if you have a love for it too, we’ll have plenty to talk about! 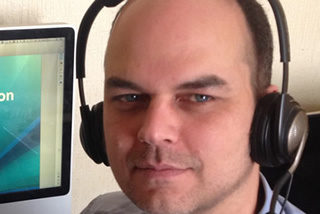 I teach online because of my interest in technology and other cultures. This is a great job because I can work with people from all over the world; helping them learn and learning myself too! 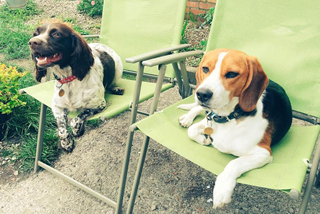 Meet Bertie the beagle and Lola the springer spaniel, my two dogs. These two beauties are often sitting in my office when I am teaching English but they are usually just sleeping very quietly in their beds! Here’s a photo of me with my lovely girlfriend and fiancee Amanda. She has been my rock over the years and she encourages me to follow my passion of teaching English online among other things too!